All the sights in and around Chiang Mai. -If you book one room/two nights or more through CMCT. Just wanted to say thanks for helping me set up my tours while in Chiang Mai. All three tours were good. I especially enjoyed the trip to Mae Hong Son. The tour guide there (I think his name was Sak) was excellent. I told my friends here in Singapore about the trip and suggested your agency for booking tours when in Chiang Mai. Thank you for your arrangement of your tour. I enjoyed very much your tour and guide, especially your guide was excellent. Now I'm in my office in Japan, and I wish to visit Chieng Mai again near future. Thank you again. Several weeks ago two colleagues of mine, Liane Palmertree and Erika St.John, visited your city and used your services for some tours in and around Chiangmai. They thoroughly enjoyed the tours and recommended that I get in touch with you since I and another colleague will be arriving in Chiangmai on April 2. We will be interested in day and evening tours for April 3, 4. We are interested in going to the elephant sanctuary as well as some villages where we could buy some silks, cottons and artifacts. Can you suggest some itineraries with price lists for us. You have a good product & an excellent team of guides. Special mention for Khun Noicy (sorry if i spell it wrong) & his partner (Uncle Nong the driver). They really are an honour for your company. Wish you well in the business. Will definitely recommend Carnival to friends. Keep it up. Hope to see u soon. Thank you very much for facilitating my visit to Chiang Mai. Opel was an excellent guide. Thank you for finding us an excellent person. I have recommended your tour company to many of my friends. AFTER RETURNING TO ISRAEL, I WOULD LIKE TO THANK YOU VERY MUCH FOR THE EXCELENT TOURS YOU ORGANIZED WITH THE BEST TOURS GUIDES. WE ARE NOT STOPING TELLING OUR FRIENDS ABOUT THE TOURS AND WE ARE RECOMMEND VERY MUCH AT WORK, EL AL ISRAEL AIRLINES ABOUT YOUR COMPANY. Just a quick note to let you know how much we enjoyed dealing with your company in the Chiang Mai area. 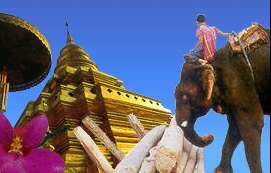 We took a 1 day tour in Chiang Mai and a 2 day tour in the Chiang Rai/Burma areas. We would have never seen the beautiful areas and scenery without the help of your very professional guides Tu and Na. My wife is Thai, and even she was impressed with the beauty these guides showed us. I would highly recommend your company to anyone bound for the Chiang Mai area. It was a true pleasure. Thank you. Many thanks for arranging all the travels for my family and I. Everything went on smoothly (except perhaps for the rain). I will strongly recommend my colleagues and friends to you if they ever want to visit Thailand. My family and I would like to said thank you very much for the arrangement of our trip in Chiang Mai. We are very enjoy during our trips. Dear Khun Tong, thank you for giving us a very good tour guide (Pong) & driver. We really enjoy our trip to Chiang Mai. I think Pong deserved to be rewarded for a job well done. Thanks very much. My friend David and I are now back in New Zealand and wish to say thank you for the arrangements made for us regarding our hotel accomodation at the Suriwongse Hotel, our airport transfers as well as the various tours. We were impress with your local guide Miss Yu Ping who was most helpful to us. We enjoyed the tour of Doi Suthep and Doi Inthanon National Park.Both our guides were good. We would not hesitate to recommend your company to our people. I just wanted to thank you for the excellent service you and your staff provided me on my recent visit to Chiang Mai. The overall service was flawless and your guide and driver excellent. Unfortunately the weather interfered with my plans somewhat but I intend to return in June 2006 and hope to complete the day trips I missed at that time. Please feel free to use me as a reference at any time in the future if you need to. We just came back from Thailand and I would like to comment on the good service provided by your staff members. Everything was done very efficiently! I just wanted to write and say how fantastic our tour was. We took the three day trek with Ek as our guide, and we couldn't have had a better person to show us around. He was knowledgeable, friendly and great fun, and gave us one of the highlights of our time in Thailand. Thanks a lot, it was fantastic. One of the best tours we ever had in Thailand. The guide was well trained and the driver was very located with the area. I�ll recommend ChiangMai Carnival Tour in the future. Everthing went smoothly and your tour guide Miss PING did a wonderful job, please thank her on our behalf. You can be assured that we shall forward your reference to our friends who wants to visit chiangmai . I wish to thank you very much for your booking services for the Royal Princess in Chiangmai last week. Everything went very smoothly and I have only nice things to say. I was met at the airport and the transfer was quick. The hotel was very efficient and service was very pleasant. Most importantly, your service was excellent. I had to call your office once and your staff also treated me well. From the first contact till the very last, your emails showed that you wanted to serve well. It saves anyone a lot of trouble and worry in dealing with someone like you. I say this with all sincerity and you may feel free to use this in your advertisements online or elsewhere. Kind Regards, Jega. My family, friends and I are now back to Singapore. We would like to say thank you to you for all the arrangements for our tours and free transfer services, and especially to Yupin, our tour guide for the first and second day there. She was very helpful and patient, and did not mind accompanied us till pretty late, seen us through our dinner although our industry tour should end at 4.30 p.m. It's been really nice of her to help us even to arrange for our free transfer from hotel to the airport. Please convey our appreciation to her. The tour guide for our Chiangrai trip, Tic-tic was also kind and helpful. Thanks again for making our trip enjoyable. Have a nice day. Thank you for your reply. I just want to feedback to you that we are very pleased with the services of your tour guide, Yu Ping and the driver who were very patient and helpful on our first day at Chiangmai. We are thankful to Yu Ping for helping us change to a very much better hotel (The Empress Hotel) on 29/11/2006. The experience there was good. Thank you so much for arranging the tour. My family and I really enjoyed it the tours, especially the Doi Intanon. Your english speaking tour guides were excellent, especially Kai and Youpin (not sure if I have spelled it correctly). I will definitely recommend my friends to book through your agency when we visit Chiang Mai the next time. I write to thank you for the wonderful service you had provided and a memorable time my wife and I have had in Chiang Mai. I would like to say thank you to you for arranging my tour in Chiangmai. I would like to say that your tour guide, Mr Song is a very professional guide and he did a wonderful job. I would certainly recommend m friends to you if they wish to visit Chiangmai. Thank you again and Happy New Year to you. Dear Carnival Tours! We would like to say thank you for the arrangements (elephanttour and Kantoke dinner). Especially to Yuphin, our tourguide, who was very helpfull and patient. And also for the arrangement with the free transfer to airport. And the elephanttour were great - a memory for life for our little daughter. We would like to come to Chiang Mai again and use your company. Kinds regards Storgaard family Denmark Staying in Chiang Mai frem 9.02-12.02.07. We are from Hong Kong and just came back from Thailand. We joined the local tour #14 in Chiang mai on Jun 17. We all four girls also had a good service from the guide/driver, we enjoyed and satisfied the local trip very much. We deeply appreciated their kindness and nice. We would like to say "thank you" to the guide (we forgot the name). We must have to recommend your local tour group to friends who might want to travel chiang mai by own/group. Also, we must join your tour if go to chiang mai again. On behalf of my family, I would like to thank you for your service. Your guide, Ms. Yu Pin (I hope I get her name right) has been very helpful. She helps us to write the names of interesting places to go to in Thai language so that we wont get lost of confused. The trip has been so memorable especially for the kids. They love riding the elephant and also the raft ride. I really hope that you will keep up your good service and I will surely recommend your name to my friends if they ever decided to go visit Chiangmai. We would really like to thank you for your patient and hospitality throughout the whole journey. You have been an incredible host with the warmest pleasant personality. We all felt so welcome and we knew that we could rely on you. Thank you so much for your generosity and going out of your way for making us feel right at home. Thank you so much for everthing and have a good year ahead. I would like to say a big Thank You to you, your office staff, the driver and tourist guide that contributed to our succesfull trip in ChiangMai. My family was very happy with the trip. It was beyond expectation. Everything was great, the place, food and people. I strongly recommend my friends to visit ChiangMai and use the service of your agency. I wanted to pass on that we really enjoyed the trips, and the 3 guides could not be more helpful.